Campephaga leucomela Vigors and Horsefield, 1827, Queensland. 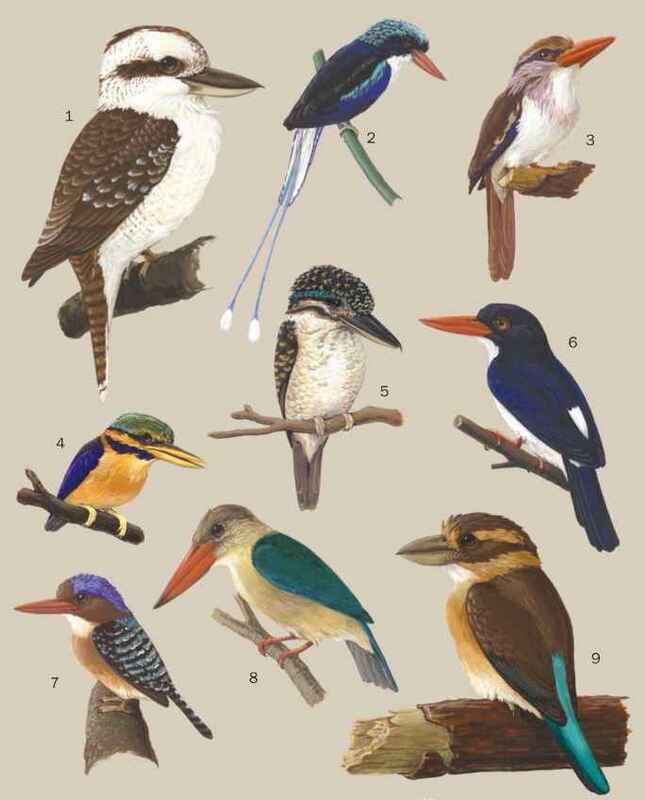 Fifteen subspecies. English: White-browed/pied triller; French: Echenilleur varié; German: Weißbrauenlalage; Spanish: Gorjeador de Cejas Blancas. 6.7-7.1 in (17-18 cm); 0.8-1.3 oz (24-37.5 g). Males have black upperparts, dark gray rumps, and white markings through the wings. Their underparts are white with fine dark barring and a cinnamon vent. Females have browner upper-parts and barred, gray-buff underparts. 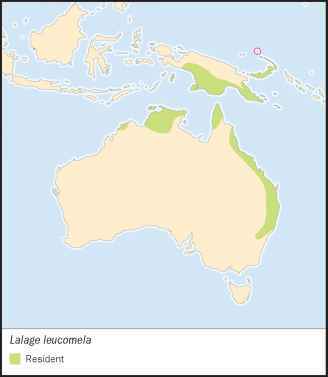 L. l. keyensis: Kei Islands; L. l. rufiventer: Melville Island and coastal Northern Territory; L. l. leucomela: North Bismarck Archipelago, East Queensland to North New South Wales; L. l. yorki: North Queensland; L. l. polygrammica: Aru Islands and east New Guinea; L. l. obscurior: D'Entrecasteaux Archipelago; L. l. trobriandi: Trobriand Islands; L. l. pallescens: Louisaide Archipelago; L. l. falsa: New Britain, Umboi Island, Duke of York Islands; L. l. karu: New Ireland; L. l. albidior: New Hanover; L. l. ottomeyeri: Lihir Island; L. l. tabarensis: Tabar Island; L. l. conjuncta: St. Matthias Island; L. l. sumunae: Djaul Island. Canopy of tropical and subtropical rainforest, dense eucalyptus forest, forest edges, and secondary growth; sometimes in mangroves and dense savanna; also gardens. Normally seen singly or in pairs, sometimes in threes. Inconspicuous but vocal, with a loud, rolling, repeated "brreeer" call; several birds may call together. Sometimes sits quietly on exposed perch. Sedentary over most of its range; some movements in Australia. Feeds on insects (especially caterpillars), fruit, berries, and seeds; particularly attracted to figs. Assumed monogamous. Breeds during rains. Nest is a very small shallow cup of dry grass, twigs, rootlets, and spider webs on a horizontal branch or fork. Lays one egg; incubation/ fledging unknown. Not threatened. Considered locally fairly common in New Guinea and North Australia.